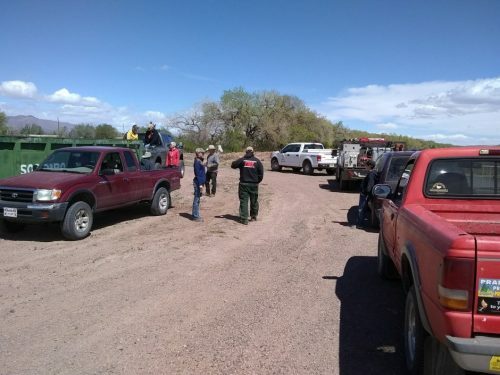 Socorro’s Save Our Bosque Task Force (SOBTF) had a trash cleanup morning along the bosque trail and levee road, starting at Otero parking area. 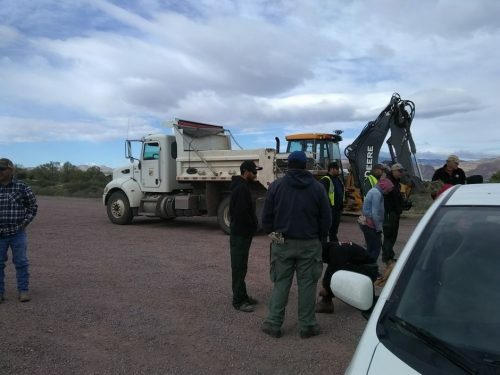 Over a dozen citizens were joined by several Middle Rio Grande Conservancy District (MRGCD) staff and two buses of students from Cottonwood School. The MRGCD (AFAIK) provided a dump truck, backhoe, and dumpster. This was my first project with the SOBTF. This stretch of trail may be included in the Rio Grande Trail that is being designed, and is part of the Socorro Alternate section of the Grand Enchantment Trail.